A Neighborhood Watch program is perhaps the oldest crime prevention program in existence. This community-based program encourages neighbors to get to know each other, teaches neighbors how to look for and report suspicious activity, keep an eye on each other's homes and property, and safeguard their homes from criminal activity. This program had its start in 1972 when the National Sheriffs' Association developed the original program. At the time, Police chiefs and Sheriffs from around the country were looking for a program that would decrease the increasing burglary rate across the country, and the Neighborhood Watch seemed to be an ideal tool in the fight against crime. Since then, it has been proven that an active Neighborhood Watch program can significantly reduce crime in a community. Ongoing Neighborhood Watch meetings and events in a neighborhood keep the program alive. Quarterly meetings are held to update residents on current crimes trends in the community. Citizens working with law enforcement in a joint partnership is a highly successful means of keeping a community safe. 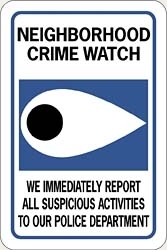 If you'd like to know more about the watch you may look over the Neighborhood Watch Handbook. Join the Willow Brook Watch - Click here.